Two different modes of work in engaging with rural women in Nagpur to engage with their bank accounts gives vital lessons to Grameen Foundation and their partner on increasing efficacy of programs. The following is an account of my visit to Nagpur district where a unique program on digital financial literacy is taking place, encouraging women in the household to learn and transact with their bank accounts digitally and enhancing their digital awareness on the way. Grameen Foundation and AlignUs, a social impact organisation, are implementing a unique, large scale digital literacy program with marginalised women (and men) in Nagpur district. A staff member from AlignUs, Ms. Shipra Bindra, currently coordinates project work at Katol, Kalmeshwar and Savner blocks and comes across as a trained and confident woman training others on digital methods of accessing and engaging with their bank accounts. One such interesting training session was going on at a village named Kondali, near Nagpur. This village in Katol Block saw a new and very enthusiastic trainer emerge from its own inhabitants. A very active and bubbly personality, Mamta is very well read and holds a Master’s degree in Social Work. Growing up in that locality, she always felt the need to contribute to the society and ‘do something’ for her people. Given the opportunity as a trainer by Grameen Foundation, Mamta has been more than happy to take up the responsibility and contribute to the best of her capabilities. Her simple but effective approach is built on her keen observation and understanding of the life of people in these villages. This prompted her to engage with women of the village in the evening rather than the morning hours when most of them are busy in their agricultural activities in their fields. Trust and respect have been deciding factors. So much so that it took her less than a month to gather a group of women from nearby households for training sessions on digital literacy and how to engage with their bank accounts in a way that reduced drudgery, saved opportunity costs and were not a burden on their daily work. Out of the challenging and question filled sessions that she had with her women’s groups, she acknowledges that women have been asking her questions on digital ways to engage with their bank accounts which saves them money and reduces their trips to the bank, which in most cases is far off from their residences. Contrary to what we think, there have been questions about the security of the information that is entered into devices and she has found this a bit overwhelming. All these questions have not deterred Mamta. She now plans to increase the number of groups she engages with and makes frequent visits on foot to neighbouring villages to encourage women about the benefits of digital banking. Our next stop was at the Chikhlimaina village (Katol block). Here, we witnessed an altogether different manner of imparting digital finance training. 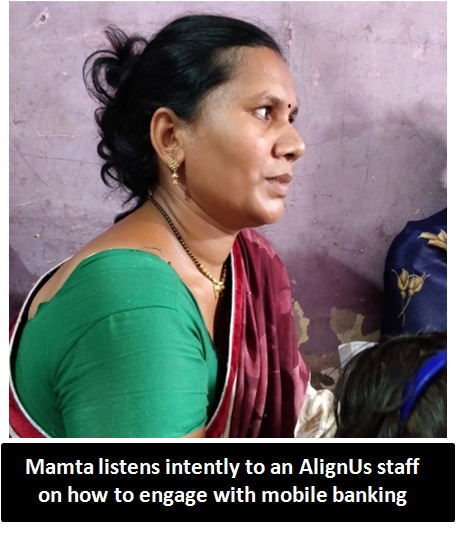 Trained field workers recruited by AlignUs conducted highly personalised door to door sessions on digital finance services. A small group discussion with women later ensured the formation of a strong relationship between project staff and inhabitants and ensured better buy-in of the project activities. One occurrence struck me during the entire interaction. 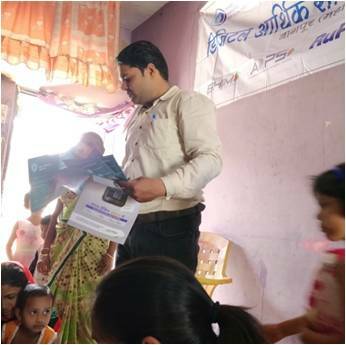 Children in the households (below the age of 14 years) seemed to take a lot of interest in the training sessions and helped their mothers understand these financial transactions. While some seemed intrigued by what was going on, I found it encouraging that children were actually taking interest thus preparing them for engaging with their accounts in their adult life. On the whole, the momentum created in the Nagpur district gives a strong hope for a digitally enabled population in the district and can be a model that needs to be replicated around the country to help achieve the vision of a Digital India.